And I'm ready to go. Catching the 6am plane in the morning and heading east. Headed to Maryland to visit my sister. And Friday we are flying to Bayonne, New Jersey and boarding Royal Caribbean's Brilliance of the Seas. We are cruising the New England States and Eastern Canada. I have never been down East and so looking forward to this trip!! So, today was a day of completing and packing. Had to have some nana time with my Harlee boo. Looking forward to spending time with my sister. Looking forward to see the trees changing and the awesome red trees of the East Coast. Maybe seeing some whales or puffins. Seeing where Anne of Green Gables started. Maybe some fun photo shooting of lighthouses, Peggy's Cove, the Bay of Fundy. I am gone until Oct. 2. I will try and post when I can, but Internet on the cruise ships is very pricey. But I promise to take lots of photos. See you on the flip side. I have had this project almost completed for quite a while!!! All I needed to do was make the binding and sew it on! I can be such a procrastinator over some projects. I wanted to be able to display it for Halloween. So today, I got my rear in gear. The binding is sewn on the front and tonight I will hand sew it on the back. I also sewed a fall tablecloth for my kitchen table. I have had the fabric since this time last year . You see what I mean???? So here is a little peek at what I am making. I worked yesterday and came home and crashed. I was in bed by a little after 9 pm. It certainly helps that it gets darker earlier. I also got my house cleaned . I rescued Kirsten-she locked herself out of her house. I picked up Harlee after school. A busy little day. It seems like we are ships passing in the night. Curtis has been spending a lot of hours on the road lately. And when he is home on the weekends I have been working 12 hour shifts. He was on the road all day yesterday with 7 hours of driving. The same was for today, so I offered to go with. That way I could spend a little quality time with him and also help with the drive. I packed us up a lunch. And guess where we went???? Yes,we were back to Glacier National Park, to Two Medicine where Curtis interviewed a gal. All that driving for one interview. But we did stop in East Glacier for a taste of yummy huckleberry pie. One place we stopped was all sold out!!! As you can see it was a beautiful day for a drive and it wasn't too smokey. The mountains were very clear today. 9/11. We shall Always Remember!!!!! and we will never forget!!!!! It has changed this country in so many ways. It was a day off for me and I spent it quietly at home. We now have another generation of Girl Scouts in the family. Kirsten signed Harlee up to be a Daisy this afternoon. Brings back lots of memories. That's my motto for the past two days. I came home exhausted last night. I arrived home late and was in bed by 8:30 and asleep shortly after. Tonight, I'm just tired. Off tomorrow and need to catch up around the house just a little. Cooler air has blown in, but, oh my, is it smokey here. The house is closed up withheld AC on. I will leave you with a couple of photos. The view from the top of Logan's Pass in Glacier park. This morning we had the company of H&N while there mom and dad were working. Nic was especially good for him. And we had fun with the grandkids. Papa made pancakes for a yummy breakfast. We played Wii, Leapster, took photos. Harlee stamped. And just had a grand old time. Nic likes to be in my craft space. All the machines intrigue him. But one must watch him like a hawk. So I took a few photos. After they left I ran to the grocery store, ran to work, stopped at the fruit stand. And spent the rest of the afternoon ironing-mostly Curtis' shirts. And we took photos of each other! Washing Nana's veggies. I have never had such well scrubbed tomatoes. Do you think they could look at the camera at the same time??? The answer would be NO! Okay, okay, I know I haven't posted since Tuesday. Just taking a small break and a breather. Have been busy on my days off. I bet you can't believe that one, can you???? The outside temps have been much more tolerable. I guess fall is slowly making an entrance. I even see some leaves beginning to turn. 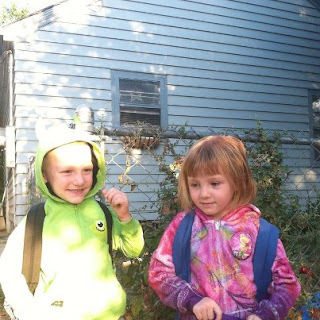 I have been picking Harlee up from Kindergarten, as her mum is waiting for Nic's preschool bus. She tried to go and pick him up the other day and he wouldn't come home with her. He wanted to ride the bus. And he hasn't got kicked out of preschool yet. I'll leave you with a couple of layouts, I recently finished. Pictures aren't the greatest as it was very over cast the day I took the photos. to start preschool. 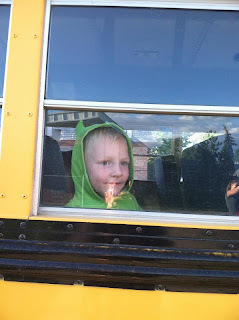 He was on the bus at 7:50--way too early for a preschooler. I think his mum may be driving him, so he can get a little more sleep. But he sat on the bus and his mum didn't hear from the school. And he got on the bus to come home. Major accomplishments for Nic. He came home happy, although somewhat subdued for Nic. Said he had a good day. I asked him if he sang songs--yep!!. Asked him if he had a story--yep!! Asked him if he played outside--yep. A boy of few words, just like his daddy. And he ate all his lunch Kirsten packed for him. And he fell asleep in the car, when they went to pick up his dad from work. A busy day for the little guy. Kirsten took these photos this morning of the happy little fellow. As for me, I had a pretty chilled out day at home. I am very tired after my last week on the merry- go- round. I did get my sewing space cleaned up some. I did do a load of towels. I did cook a yummy dinner. So, not so bad. Today is Labor Day. We are also into a new month-September. I have worked over the weekend and am tired. But today wasn't to be a relaxing day. I was out this morning staining our deck. It had quite a few spots that needed to be redone. We have had the stain since the beginning of July, but there just hasn't been the right moment to get it done. Curtis power washed it all down and so it was ready to go today. And it is all finished now. Kirsten invited us over for a yummy lunch. Friday I had started putting together a blanket for Nic for quiet time at preschool. I had got some cute material out in Seattle. but I still needed batting, something for the back and material to make the binding. I headed out after lunch and got those. I set to work. So for most of the afternoon and early evening I se wed away. But , guess what? ?- I finished it and Curtis ran it over to Kirsten's so the little guy can have it for school tomorrow.